Akki Roti is a Popular Karnataka Recipe made with Rice flour as a main Ingredient. 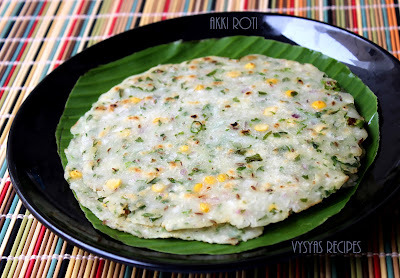 Akki means Rice and Roti means Pancakes of Native kannada. (wikipedia). you can add onions,carrots,cucumber soaked chanadal & sesame seeds to the dough for extra taste.During avarekalu season,you can add avarekalu (field beans) to the dough to make avarekalu roti.In my home,my Mom often makes this roti at evening times,after she comes from office.It is an easy and Instant breakfast/Dinner Recipe. coconut (grated) - 2 tbsp. Chop the onions,Green chillies, Curry leaves and Coriander leaves finely. Soak the Chanadal for 1 hour before preparation. Take a mixing bowl combine rice flour, Soaked Chanadal, chopped onions,cumin seeds,Green chillies, coriander leaves, curry leaves,salt and Grated coconut. Mix everything by adding water little by little into soft and spreadable dough. Take a plastic sheet or banana leaf grease with oil, take big lemon sized dough and spread it into a circular disc, in between wet your hands in bowl of water. Heat the tawa, when it is hot,place the roti, over the tawa, drizzle some oil. Cook till, both the sides turns little golden brown colour then remove it from tawa.Serve hot.I wanted the roti's to be little soft.so i have taken when it turns little brown.if you want it more crisp, cook for few more minutes, till it turns crisp, and more golden. you can add 2 tbsp of crushed roasted peanuts to the dough for extra taste. You can also add Ground Coconut + Green chillies + Ginger + salt while making the dough,instead of chopping it. you can add cucumber(grated) to the dough.you can also add any of these veggies like Carrots(finely chopped)/bottle gourd(grated)/ beetroot(grated)/Radish(grated)/ spinach/Methi leaves/ dill leaves/mint leaves/drumstick leaves to the dough for extra Nutrition. Avarekalu Roti: For 1 cup of rice flour, you can add 1/4 cup of Cooked Avarekalu(field beans),and add rest of the ingredients as i mentioned above to make the dough. 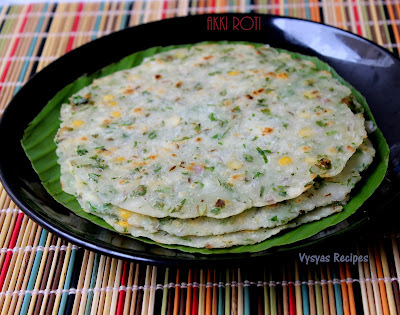 Spinach Roti : you can blanch the spinach, puree it and mix it with rice flour,then add all other ingredients as i mentioned above to the dough, and cook as usual. Serve with Tomato Thokku,Mango Thokku,Andhra Tomato Pickle,Gutti Vankaya Kura, Avarekalu Sagu, or Coconut Chutney. I've never tried this recipe before. Love all the flavors in this roti! Going to try it very soon! This is one of my favorite :-) Looks so perfect and yummmmy! Akki roti looks delicious very nice. This Akki Roti looks delicious. looks super delicious and tempting to eat..